Your new kitten is adorable and cuddly. But sometimes, at night, she transforms into a violent wolverine, attacking your hands and feet with wild abandon. What can be done about this nightmarish habit? Fortunately, there are ways to keep your kitten from sinking her little fangs into your ankles every time you turn away. Why is she biting you? 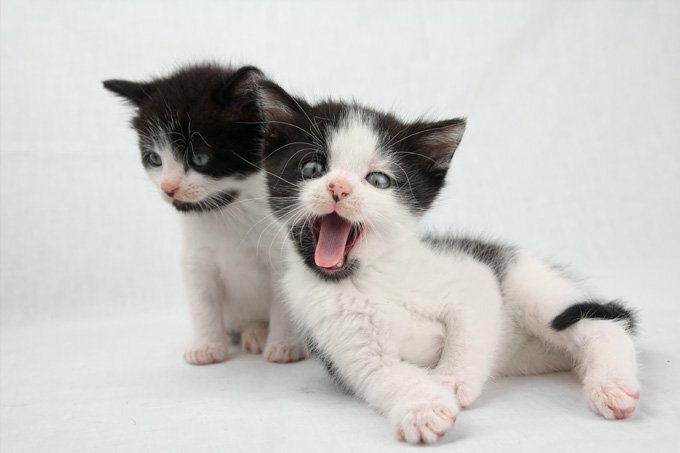 Kittens teach each other something called “bite inhibition,” which essentially means that when they bite too hard, the other kitten bites back, eventually reducing the incidence and severity of such bites. But if your kitten was separated from her littermates too early, she may not have gotten a chance to learn that lesson. When your kitten clamps her teeth into your hand, you can’t stop the problem without knowing why she is biting you. Did the issue start when you touched a certain part of her body, such as her paws or tail? If so, you may want to slowly accustom her to handling in that area. Another scenario: Were you moving your hand in plain sight or under a blanket? In those cases, she may think that either your hand is a small animal, or that you are playing a game with her. Don’t encourage this behavior by allowing her to bite during play. It should never be okay to bite your hands, and consistently offer her a toy as an alternative to play with. As stressed above, don’t pick out cat toys that encourage kitty to bite your hands. It will be hard for her to understand that playtime gloves mean she can bite your hand, but when they’re off, you do not want to be bitten. Don’t encourage her to play with rings, shoelaces, bracelets or other items on your hands or feet, and stay consistent with your message of what she can and cannot play with. Also understand that kittens do enjoy biting things as part of normal play, so do provide appropriate soft cat toys that are large enough for her to hang onto and bite, such as stuffed mice. You’ve made the mistake of reaching for her favorite cat toy when she is already amped up for play and before you know it, her fangs are meeting up with your fingers. To minimize the damage from the bite, you will have to do something completely unnatural: Freeze. Cats are primarily motivated to bite by prey-drive, so the harder you pull away or the faster you move, the tighter she is going to latch on. If you can bear it, just stay still for a moment, say “no” and gently blow air in her face. Most kittens will be so surprised by the unentertaining turn that this game has taken, they will let go and run away.